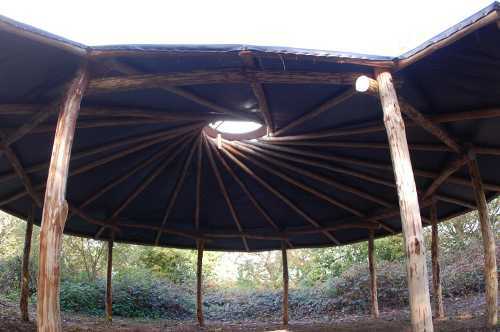 This free standing roundhouse is an 8.5mtr outdoor classroom for Brixham Cofe School. The posts sit on stone at ground level. 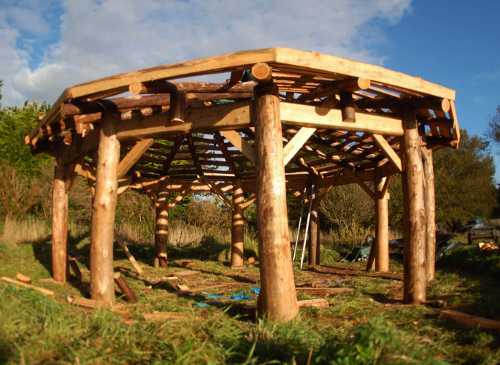 The school hired me to build the timber frame and will be adding the turf roof and membrane themselves. 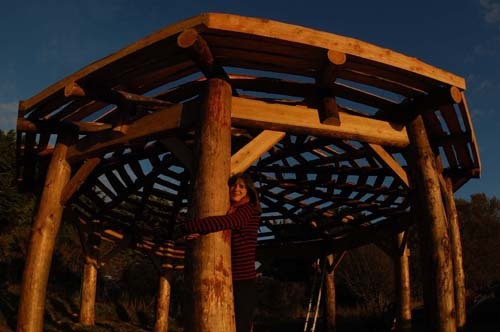 All components in the Brixham roundhouse are larch. Larch is at the low end of the acceptable range of out-door durable construction timbers. Larch is however cheaper than chestnut and that is why we’ve had to use in on this occasion. There are 10 up-rights at about 12” thick at the top end to accommodate the ring beam tenons. These tenons are 5’x5”x3” and are pinned in place. The ring beams are about 12”x3”. Every up right is wind-braced with an 8”x2.5” beam mortised into the up right with a side shoulder tenon. Each primary rather is pinned at the apex and housed and pinned at the post end. I dropped this reciprocal roof in the conventional way. I set the rafters up at 18dec and after the drop ended up with 16dec. I tend to work out the roof geometry on paper first, (try it for real at ground level first if you are un-sure). I’m finding now that my roofs are quite predictable dropping about 6” so I can be fairly accurate in setting the final roof pitch. The secondary rafters are pinned to the primary rafters and to an up right mounted on the ring beam. The edge boards are 8”x3” and coach screwed and pinned. We have battened the roof with milling off-cuts. Wow, what an exciting and heart-warming day I have just had! 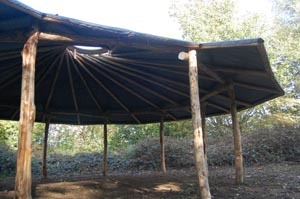 I‘ve just returned to Queens School in Watford to do a safety inspection of an outdoor classroom I built there with the children. I always re-visit building projects 6 months in to check that it has settled in and is safe to sign off. So much has happened since I was last there. The staff and students have really made this space their own. Wood chip paths have been laid through the spinney and logs have been installed for seating. Rustic seating also adorns the classroom and it is obvious that the students and staff are really enjoying the space. I’m really pleased with the way the structure has seasoned and settled in. During building we had worried that in the unexpected scorching sun the poles would season too quickly. Amazingly a small bird, yet un-seen has taken to using the structure as a place to hunt. Copyright © 2019 wholewoods All Rights Reserved.